DigIt is a simple and addictive game for mobile phones with numeric buttons. Try to earn points, build combos and score big by pressing the right button at the right time. 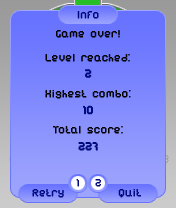 A moving ball indicating when to press will speed up as you level up, while more possible buttons are added. Keep up with the increasing pace and variety without making mistakes to set the highest score. In DigIt, a ball moves across the screen around a circular groove. At the top, there are three target areas: one center and two sides. 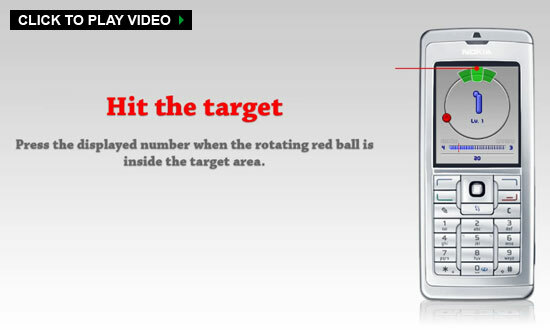 The player scores points by pressing the number displayed in the center screen at the exact moment the ball is inside a target area. The number is selected randomly from a couple of possibilities. More points are awarded for pressing when the ball is inside the center target area and doing this multiple times in a row builds up a combo. 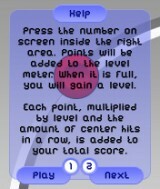 After earning a certain amount of points, the level increases and brings a new ball speed and more possible numbers. 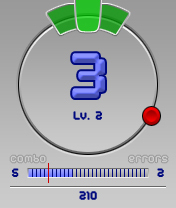 The actual score added is determined by the points awarded for hitting a target area, the combo multiplier and the level multiplier. DigIt features one continuous game mode. Start the game and keep on going until you can’t keep up anymore. Next to that, there are neat start, help, pause and final score screens.